Kampot, 캄보디아의 하이 타이드 캄폿 | 호스텔월드에서 예약하세요. Located upstream from Kampot town, High Tide is the place for chilling out. 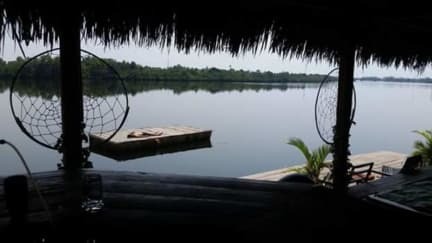 Surrounded by native greenery and mountains, set on the river with bungalows, dorms, private rooms and hammocks with nets. A full restaurant is available serving up western and traditional khmer dishes, while the bar serves up to 12 pm.